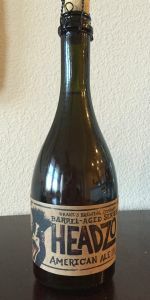 Barrel Aged Series: Headzo American Ale | Drake's Brewing Co.
20th Anniversary Strong American Ale aged in whiskey barrels. Part of the Barrel-Aged Series. For my 2000th rating I figured I’d choose a special beer from my cellar. Not sure what to expect but knew this was going to different. No pop from cork pours flat without any head but that is to be expected with 18% and a few years on it. Smells of Whiskey and sweet molasses. Taste is not what I’d expected. Extreamly sweet honey like. Not much alcohol taste but very warm going down. This is an absolutely incredible Ale. So smooth and easy drinking. the sweetness is addicting. One of the best beers I’ve ever had! From the label: "A truly massive amount of English malts lend flavors of caramel and biscuit to our biggest brew yet...through fermentation our brewers nursed Headzo to a 18% ALC/VOL before transferring the beer to Wild Turkey Whiskey barrels that infused flavors of caramel and vanilla to this smooth, monstrous beer..."
Wow! This is the best beer that you've never heard of. Very complex mix of flavors that my unsophisticated palette isn't capable of comprehending. Very reminiscent of Utopias...without the $200 price tag. tastes like a muscat wine. i was expecting something a little more beer-y but after a few sips i was sold. smells like honey and tastes like golden raisins and more honey. a smooth and easy drinking 18%. s- huge nose! strong honey, sweet alch, bourbon and vanilla. t- huge flavor coats the mouth, strong honey, oak. this is massive. the flavor lingers great. not over the top sweet. taste best described as a ba strong pale ale. no alch burn but a warming in the chest. o- fantastic beer by a local favorite. really enjoyed this, really wish i had this one draft. bottle version is great and ready to enjoy right now. main thing bringing this down is the price. hefty tag for a 500ml. wish i was able to get more of this guy. Barrel Aged Series: Headzo American Ale from Drake's Brewing Co.